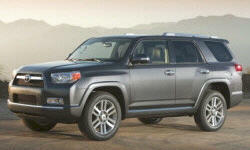 I am looking to get another 4runner, body type doesnt really matter I just want good reliable transportaton. I had a 3rd gen and put close to 220k miles on it before straying away for a few years..All things equal,miles, maintenance records, number of owners, etc is there any reason why i shouldnt buy an older 04 for thousands less than say a 10 with equal miles? The 4Runner is one of the most reliable and durable cars so I wouldn't worry too much about getting the 2004 over the 2010. They were pretty similar because Toyota didn't change much of the car between gen 4 and gen 5. Both are a big step up from gen 3. Gen 4 had a problem with the dashboard cracking.